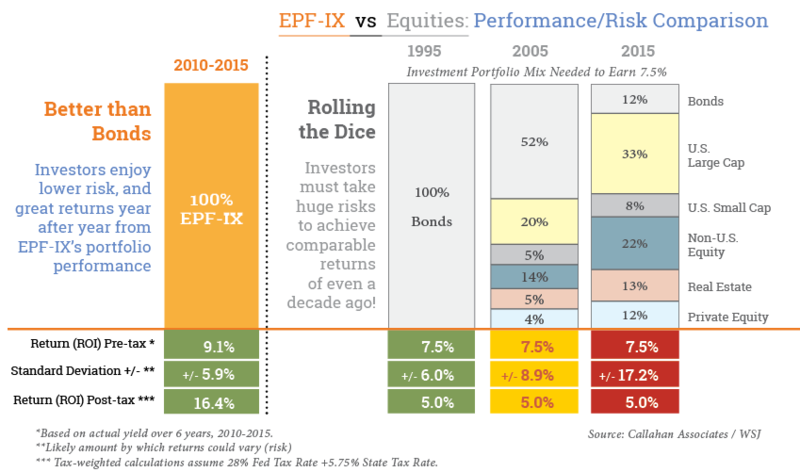 Below you will see a comparison of the EPX-IX fund performance versus the Equities or Bond market performance. The diagram below demonstrates how Oil investments are historically better than Bonds, due to lower risks and greater returns. EPF-IX has consistently delivered Quarterly dividend payouts to partners every quarter since inception. EPF-IX has not had a negative month, quarter, or year in absolute returns since inception. EPF-IX has access rights to $ millions of Proven Undeveloped (PUD) assets. Note: look at the Standard Deviation row under the orange line in the diagram to see the how variable the market has become since 1995.